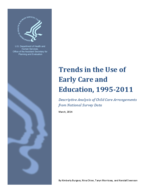 The period from 1995 to 2011 was marked by much change in the ECE sector, both in the types of care arrangements that families used and in rates of participation in various ECE settings by subgroups of children and families. Two overall trends observed were the increases in the use of public preschool among three- and four-year olds, and the use of center-based care in general. As public preschool options expanded during the time period studied, in particular for four-year-olds, overall preschool enrollment for this age group increased. Increasing public preschool enrollment and steady private enrollment resulted in a net increase in preschool enrollment among lower-income children. However, increasing public preschool enrollment for higher-income children coincided with decreasing private enrollment, suggesting that higher-income families substituted away from private preschool and into public alternatives. Over this period, higher-income parents increasingly chose center-based ECE for their children across all ages from birth to age five, particularly for infants and toddlers. However, the percent of low-income infants and toddlers in center-based care did not increase at the same rate as higher-income children. Public options for infants and toddlers remain more limited: in 2012, the Early Head Start program served approximately 150,000 children under age three, whereas over six times as many three- and four-year-olds (approximately 950,000) were served by the Head Start program. An expansion in the supply of high-quality ECE options for low-income infants and toddlers may help to narrow the income and age disparities in their enrollment in ECE programs.